I don’t recall the exact moment when I made up my mind to create a new persona for myself. It was an idea that grew over a period of several years. It emerged, I think, from the frustration of dealing with all the obstacles in the writing game. As most writers will tell you, the timeframe for publishing a novel is exasperating. The creative part of the actual writing is soon eclipsed by the interminable process of submitting a manuscript to one publisher after another, waiting for someone to say yes. Even that is not the end of the road, rather it is the beginning. Publishers have catalogues of books coming up. Lists of them. Yours gets slotted in there somewhere and you find yourself twiddling your thumbs for anything from a year to eighteen months or longer. I’d dealt with this for years. I’d become resigned to it. In between there were other distractions. Translations, other books. To avoid thinking too much I would throw myself into the next project and try to forget that I had a novel waiting somewhere to see the light of day. It’s out of your hands. Unless you are one of those authors who is happy publishing once a decade or, even better, has been deemed a huge success, then you are in for a long wait. By the time the book is finally out you can barely remember writing it. In most cases it will have a shelf life of a few months, if you’re lucky. After that, it disappears. I became convinced that the only way to survive this vicious cycle was to divide myself, amoeba-like, into multiple parts, all writing and producing publishable work at the same time. Surely it could be done with all that spare time between books? I freely admit that at first I saw crime fiction as an easy option. How difficult could it be? I had been reading detective novels all my life, after all. The earliest books I read were the adventure stories of Enid Blyton, the Famous Five and the Secret Seven. I’d moved on to Sherlock Holmes and Marlowe. As a teenager I was devoted to Alistair MacLean, Hammond Innes, Desmond Bagley, Gavin Lyall and various other thriller writers. Old-fashioned macho men with a heavy streak of mysogyny running through them. Surely I had learned something from all of that? Apparently not. It took me five years and countless attempts to discover the fact that crime fiction is not as easy as it looks. Indeed, an essential part of the skill is learning to make it look easy. Literary and crime fiction come from pretty much the same place, but they are entirely different beasts. Each possesses something unique that distinguishes them. This is related to the way in which they work. We recognise it instinctively when we read, of course. In practice it’s not that simple. After all, a lot of literary writers have tried and failed to make the transition. What separates the two is connected to texture and depth, to the weight ascribed to certain elements, to the balance. If that sounds vague, it’s because the line between them is fluid. Dostoyevsky’s Crime and Punishment is generally regarded as a literary novel but it could easily be edited into something that qualifies as a crime novel. Similarly, Chandler’s The Long Goodbye is a hair’s breadth away from being a literary novel. With the suppression of some of the more lurid elements it might become a story of friendship, betrayal, writerly depression and unrequited desire. As time went by and I found myself drawn deeper and deeper into crime fiction, it began to feel as if the crime-writing side was beginning to take over my life. Perhaps it was that link to my early reading. Not only had my views on crime fiction changed, but also my motives for choosing a name for my alter ego. In the beginning I think I saw it as a convenience, a way of separating what I considered my true writing from what I expected to be a lightweight distraction. I soon realised that I needed a pseudonym as much for my own peace of mind as for anything else. I needed to be able to fence off an area in my head where this new beast could live and breathe in peace, away from all the other thoughts I was having about writing. Choosing a pseudonym is not as straightforward as it sounds. I needed a solid handle on the persona I was creating. It had to be a name that was not just easy on the eye but which conveyed an essential part of me; the part I was trying to channel into the crime novels I was writing. I should say attempting to write because that’s what it was. Over those five years I tried over and over to produce something that would fit the bill. The result was a series of rough drafts. Some showed a degree of success, none was entirely satisfactory. The stories took place in a range of settings and featured a number of lead characters and they were written under the guise of various aliases. The problem, I suppose, is honesty. Writing demands a certain degree of deception. We try to convince the reader that what they are reading could really happen. We talk about ‘believable characters’ and ‘unconvincing plots’. Paradoxically, of course, literature is founded on honesty. You cannot deceive the written page. A shallow person will emerge as shallow, no matter how hard they attempt to disguise the fact. If you haven’t really got anything to say by the end of 70,000 words it will have become apparent. The hardest part of writing is learning to see your mistakes, being honest with yourself. You cannot, in that sense, fake it. So, if none of my efforts rang true, I knew it was because something was not quite in place. I had set out on this journey under false pretences. I had fooled myself into thinking that writing genre fiction under an assumed name meant you could get away with murder, literally. I was wrong. The same rules apply. Your new name has to be a part of you. Before I could begin to write a story I had to have a pseudonym that I believed in. When you become a parent you realise just how arbitrary the name-giving process can be, how one name can replace another for the sake of domestic harmony, common sense or tradition. Most of us go through life accepting the name we were given at birth, incorporating it into our perception of ourselves, and we usually manage to do so without it resulting in years of rejection, self-loathing or therapy. Choosing a pseudonym involves projecting yourself into the character you envisage becoming, and learning to inhabit that name. When I was starting out it never occurred to me to write under another name. Surely the point of literature was to express oneself truthfully and to take responsibility for one’s own words? Anything else would be a deception. Such concerns seem passé nowadays when opinions on blogs, commentaries in the pages of newspapers, book reviews on Amazon, etc., are all expressed from behind the comfortable shield of an adopted username. But maybe that proves the point. The names of our favourite authors still carry some element of the fascination we feel for their work. The bond between name and work seems almost organic. Imagine if Camus were not Camus, or Stendahl Stendahl and Kafka Kafka. The process of creating a pseudonym somehow implied anticipating that bond, instigating it, which felt both artificial and strange, rather like inserting a grain of sand into a seashell to procure a pearl. How could I do that and at the same time arrive at something that felt close and personal? It came to me at some point that ‘Gore Vidal’ was not the writer’s own name, but a combination of the surnames on either side of his family. It seemed a decent and noble example to follow and so, eventually, I settled on Parker Bilal. It was a name I grew into. Not only was it actually my name, after a fashion (a surname from either side of my family), it also reflected my position as a writer, straddling, if that’s not too awkward a word, the two sides of the East-West divide, as well as that between literary and crime fiction. In fact, the more I thought about it, the more it seemed to me that it was better suited to the task than my own name. Why had I not thought of this before? Since then, I have been struggling to strike the right balance between the two halves of this dual existence. The other side of me, the writer I was before, seems to have faded to a faint background hum. All the projects and ideas I had been developing have been put on hold waiting to be taken up again at some unspecified moment in the future. I have been put on hold. In between the Makana stories I return to those other books and try to coax them back into life. They hover in the wings like distant relatives awaiting attention. There are times when I think I understand the difference between the two sides. In quiet moments when my mind begins to move beyond the world of Makana and other ideas start to assert themselves, I am reminded that once upon a time there existed another me. Parker Bilal provides me with a conduit for a certain type of writing, the kind demanded by crime fiction; an ordered, logical, plot-driven narrative which in turn makes me yearn for the opposite – a diffuse, opaque, cyclic form of storytelling. It’s as if having an outlet for one type of writing has opened up a space in my head, allowing me a glimpse of possibilities that might not otherwise have been visible. Still, I rarely find the time, or so it seems, to explore such avenues. Indeed, when I’m in that mode nowadays normal life feels rather mundane, lacking direction even. I feel like an imposter, as if I am wearing a disguise. It’s rather how I imagine one of those superheroes with a cape might feel during daylight hours. As if I had a secret cave somewhere into which I might leap in a single bound and emerge in a multicoloured costume and a mask. 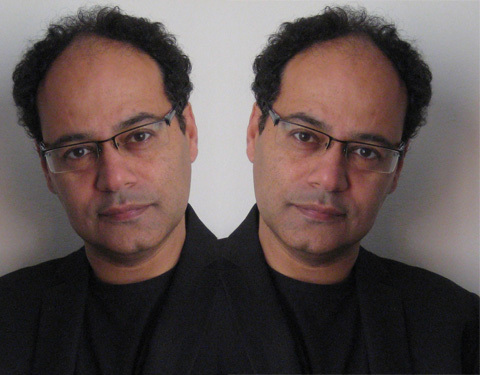 Jamal Mahjoub has published seven critically acclaimed literary novels, which have been widely translated. Born in London, he has lived in the UK, Sudan, Cairo and Denmark, and currently lives in Barcelona. 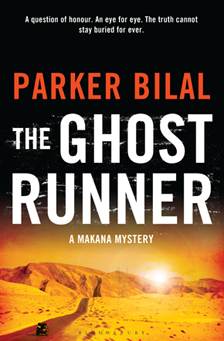 The Ghost Runner, his third Makana mystery written as Parker Bilal, is published by Bloomsbury in trade paperback and eBook.